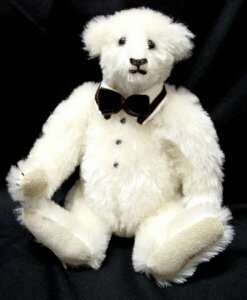 9", 2002, One of a Kind, White mohair, off white suede paw pads, three bead buttons on front to look like a shirt, white merino wool felt collar with brown velvet trim and bow tie, brown floss nose and mouth. The bear i built around a glass perfume bottle with the head build around the stopper top. Needle sculpted face and fully jointed. Signed and dated by Cindy.